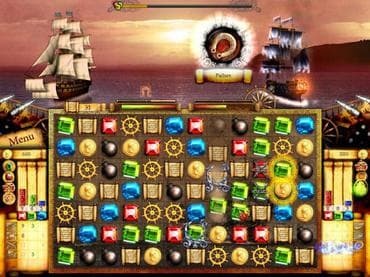 Dive deep into the fantastic world of ocean, pirates and sea battles in Sea Journey, a match-3 game that combines traditional gameplay with tactical sea battles! Tip the tide of fight with the use of key items: cannon balls, wheels, gems, while you upgrade your sailing ship using scrolls and coins. Download free full version game today, construct a tactical plan and launch your attack! Free Game Features: - Family friendly puzzle game; - Amazing graphics and relaxing soundtrack; - Unique twist to the matching genre games; - Unique power-ups; - Save / Load game option; - Game statistics; - Free full version game without any limitations. If you have questions about Marine Puzzle game, please contact us using this form.